A Medium for the Free Discussion of General Principles and Practical Measures, Pertaining to Human Progress and General Well-Being. Greenville, then Berlin Heights, OH. Publisher: Rising Star Association. 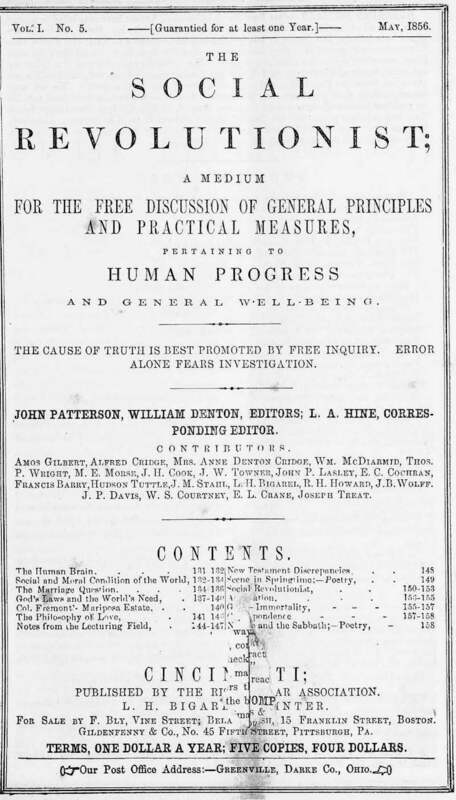 Editor: John S. Patterson; William Denton; C.M. Overton. "Free Love is a doctrine of Spiritualism. I say of Spiritualism, not of Spiritualists. Many recognize the facts of Spiritualism who know little of its philosophy. But will any intelligent Spiritualist deny that the concurrent testimony of the spheres proves that their inhabitants are controlled in their love relations not by arbitrary outside authority but by the law of attraction, affinity or Free Love? Is it not a conceded fact that the angels do not have to be hauled up before a magistrate to legalize their marriages? How supremely ridiculous the idea that the men and women of Paradise live together on the cat and dog principle because it wouldn't be respectable to separate! They are not so generous there as to sacrifice their individual happiness for the good of the community. They are not so senseless there as to stay together and scratch and pull hair from a sense of duty to their children or other members of the community, when these other members are doing the same thing from the same laudable motive! The fact that they break up false relations there and form new ones is as well established and is just as much a part of the Spiritual or Harmonic Philosophy as the doctrine of Endless Progression." John Humphrey Noyes, the Putney Community (ed. G.W. Noyes, Oneida, NY, 1931), chapter 19. There are elements of spiritualism in the journal, and A.J. Davis contributed to it. Columbia University microfilm; Yale University; University of Minnesota; Bowling Green State University; Western Reserve Historical Society; Texas Tech University; University of Wisconsin, Milwaukee.